Public utility workers in the Russian city of Samara (530 miles from Moscow) have recently employed a super effective method of making tax evaders cough up for water and sewage bills. They started leaving three-ton concrete pyramids – with the phrases “A debtor lives here”; “You are in debt”; and “Pay for your water supply” inscribed on them – in front of the debtors’ houses. Since May 2018, the pyramids have been deployed over 80 times, helping to recoup over one million rubles ($16,000) of debts. 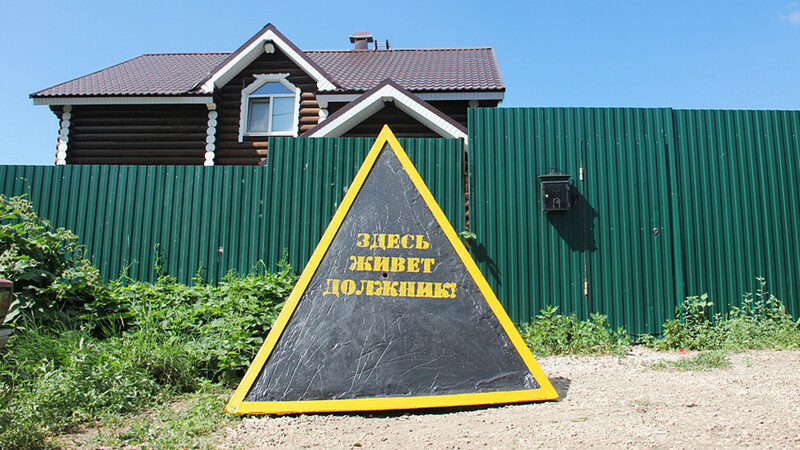 Recently, a house owner from Samara, whose debt was about 45,000 rubles ($750), demolished a pyramid – but he was recorded by a surveillance camera. Normally, there are a few ways to make people pay: A “motivated” debtor can evade bailiff officers, refuse to pick up the phone, move to a rented place, or leave town completely. So “RKS-Samara” decided to take matters in their own hands. There was even one case of a hanging pyramid (not the three-ton version, but a lightweight version) before one debtor’s window on the second storey of a house. “Obviously we don’t do this right away. First, we inform the debtor, we send letters, enforcement orders, writs of execution. But this client has expressed no intention to solve the problem,” a spokesperson for “RKS-Samara” said.